The fiancee of an Ottawa Senators player has been accused of conducting a campaign of online abuse against his team-mate and wife. Erik and Melinda Karlsson say Mike Hoffman's girlfriend Monika Caryk posted more than 1,000 "negative and derogatory statements", including wishing their unborn child was dead. They have filed a restraining order against Caryk, and the Canadian NHL side is investigating the accusations. Hoffman and Caryk deny the claims. The pair have said the harassment is "150% not us". 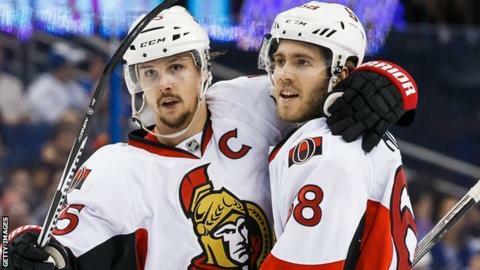 Forward Hoffman and team captain Karlsson, who are both 28, have played together for four seasons. In the court documents obtained by a number of media outlets, the Karlssons allege Caryk "uttered numerous statements that she wished my unborn child dead... that she wished I [Melinda] was dead and that someone should 'take out' my husband's legs to end his career". The Karlssons' first child, which was due in April, was stillborn in March. Forward Hoffman told the Ottawa Citizen: "We totally understand there's no place for cyber bullying. "We've offered to co-operate and do anything it takes to find out who is doing this, and support [the Karlssons]. Obviously this is a tough time that they're going through, and we want to find out who is doing this, because for some reason it's coming into our court." The Senators said in a statement: "We are investigating this matter in cooperation with the NHL and will take whatever steps are necessary to protect the safety and privacy of our players and their families."